As the Quest for Lion Knights’ castle winds down to a close and completion, spare time has been freed for the Inter-City passenger train. I recently pondered just how much of a 1980 LEGO train can you get new. While the pondering in that blog post was mostly academical, I have put the idea into practice as well, as you may have read. 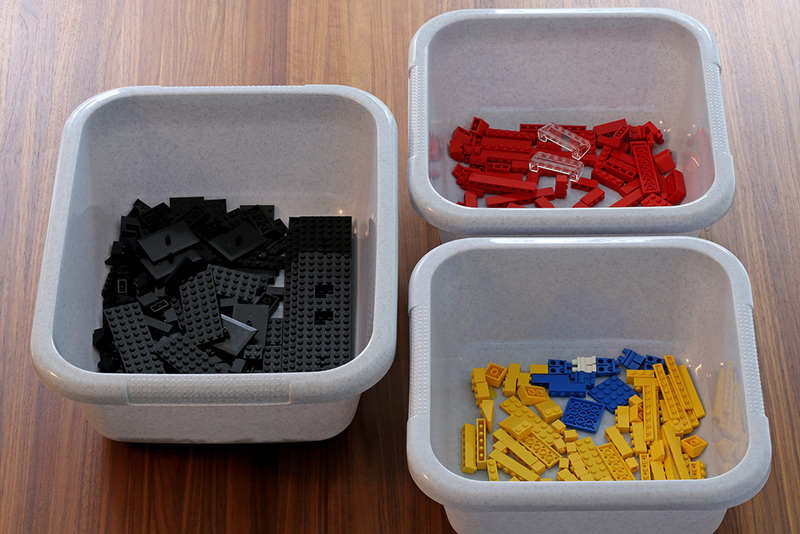 You can see from the picture below that my long-winded preparations for the Quest for Inter-City train have yielded me roughly half the train in brand new bricks, now sorted by color. This is completely excluding whatever used bricks I have managed to find from my old collection and elsewhere, that process is still on-going and is yet to be sorted. Speaking of plates, unlike before, you can see I now have the train baseplates to begin building. Lacking the suitable plates has been a pet peeve of my AFOL projects so far, but now some of that hurdle is behind me. By the way, as the baseplates are new, you can see they have larger holes in the middle than the original part in 7740 Inter-City Passenger Train. This change is because in the 1980s the electric wiring had small plugs, where as today’s LEGO trains are powered by Power Functions that have larger brick-like connectors. One of those small part changes.